Capture the buoyant effects of spring all year round with this amethyst flower pendant. Set in a sterling silver case with intricate detailing, each amethyst petal is accented by small, clear diamonds, to create a luminous 20-by-13-millimeter flower pendant you can enjoy without the risk of hay fever. 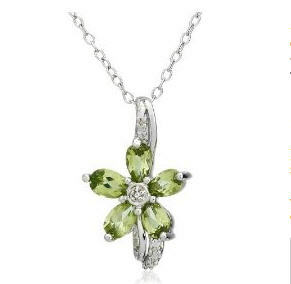 This attractive piece hangs from a simple 18-inch chain and is secured to the neck with a traditional spring-ring clasp.